You can’t blame Pixar for anything really. It’s tough to find things, but honestly they’re there. The films almost always follow the same signature moves: the long journey home, the unlikeliest of friends, the conceptual antagonist. And then they always include the signature Dumbo effect, where they just hand you a character who is so cute that you can’t help but love them–and, in turn, the movie. But no other film does these more blatantly than The Good Dinosaur. Let’s face it, you can attribute much of Pixar’s success to these attributes. People fall for them. However, when it becomes this obvious, you start to take notice unlike ever before. And with this film, it’s more evident than ever that the studio’s biggest pitfalls are what have made them the powerhouse that they are today. 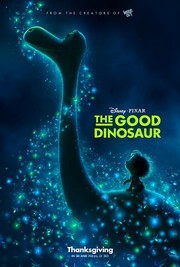 The film follows Arlo–the runt of the litter of talking dinosaurs–as he tries to discover what his true mark on this earth is. After a series of events finds him extremely far from home, he must figure out his way back with the unbidden assistance of a feral, dog-like child, Spot, who is actually inadvertently responsible for a few tragedies in Arlo’s life already. The Good Dinosaur is the most Pixar-iest Pixar movie thus far. So much so that it’s becoming increasingly more obvious what they’re doing and why they’re doing it with each film that comes along. This one’s a “journey home film” in the strictest way possible–not really playing around with that concept a whole lot like they do with Toy Story or Wall-E. Of the 16 films made by Pixar over the last 20 years, I’d say all but three of them are about the characters finding his or her way back home. And I understand why–mostly thanks to this movie–because it’s easier to find conflict. Throughout the film, there is mishap after mishap, without much room to breathe or develop it’s own organic voice. I wouldn’t say it’s predictable, but it does have a tendency to be by-the-numbers a bit. It also may be the weirdest Pixar movie to date–which actually helps set it apart from the others. In one scene, we see Spot literally rip the head off of a live bug that’s the same size as he is. Another has a pterodactyl eating a cute furry little creature. In perhaps the most odd moment of the film, Arlo and Spot eat some hallucinogenic fruit and proceed to trip out with much detail. But it’s not to say that I didn’t like this movie, because it’s actually very pleasant. I mean, he humor is just middle of the road–I probably laughed the least amount out of any Pixar film. But I was also smiling throughout a lot of it. Also, the visuals are spectacular–a triumph in its own right. The depth of the characters are another highlight, as both children and adults will be able to relate. Arlo is likable, but not Disney perfect. He shows hints of selfishness and stubbornness, which round him out well. You’ll hear pleasant echoes of City Slickers, which is perhaps the movie’s most unique quality. It’s not as tight nit as you would expect. It starts off painfully slow, but mostly picks up after about 30 minutes. Also, there is not a lot of tonal balance found. It makes jarring leaps between comedy and sheer terror in a few instances. We see your road movie, Pixar. We’re just curious if you’re using it as a fallback now. Try moving away from it more often. 2012’s Brave was awesome. It felt like one of the most unique films to come out of that studio. While The Good Dinosaur is actually a really good movie, and I like it way better than Inside Out (yeah, for real), I still think that Pixar can do a whole lot better. At least with this film I can watch it multiple times and not get frustrated doing so. In staying the same, it’s safe to say that Pixar has devolved a little bit with The Good Dinosaur, but nonetheless, it’s still way better off than what most other studios serve up as their animated offerings.